To focus an enlarging lens when it is used on a camera, a helical mount is needed. 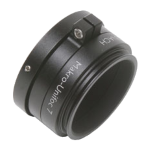 This mount is extremely compact with 12mm of displacement. In the shortest setting, the mechanical length is 20mm. It comes complete with a focus locking screw.